Watch exclusive content from top entertainment producers, web celebrities, news & more on Perk TV! 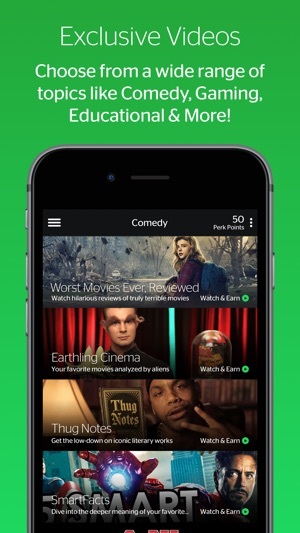 - Thousands of high quality, streaming videos from a variety of topics! - New videos added daily! 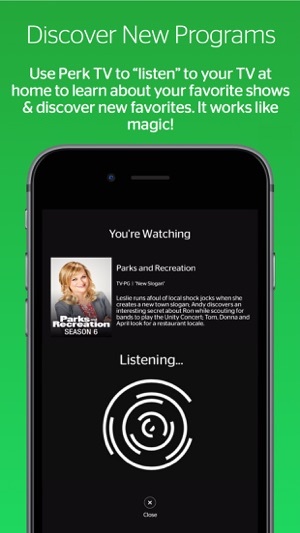 - Use Perk TV to "listen" to your television at home to pull up more information about what you're watching. - Learn more about your favorite programs & discover new favorites! - Choose from hundreds of gift cards including Amazon, Walmart, Gap, Starbucks, Target, and many more! 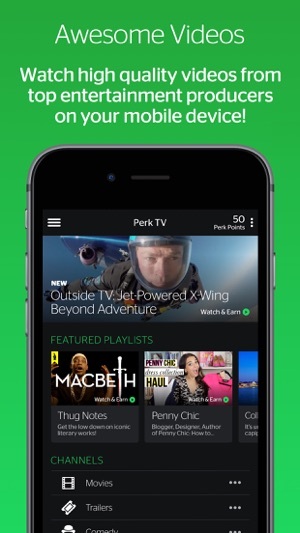 Get Perk TV. Watch Great Videos. Discover New Favorites. Have Fun! The app is useless. It will be working fine one second and then the very next, no ads will play and no points will credit. It continues like this for quite a while, too. I could restart or reinstall the app, and it still won’t play any ads. Then, out of nowhere, it’ll be working well again. It’s been like this for well over a month now and I’m getting very frustrated. The app has always had so many different issues. Clearly, its developers aren’t really preoccupied with the app’s functionality. Unbelievable. PerkTV is functioning for me. I am not sure if it’s because I have a FB email address linked to all Perk apps. As I have noticed that ahost of others are not so happy with this app. Personally, and to be totally honest the WatchBack app and Viggle app are better than PerkTV. The ads are insanely annoying on PerkTV, with a reduced quantity on both Viggle and WatchBack. Yes, ALL 3 play ads, but WatchBack and Viggle seem to present the viewer with less. Your call. And good luck.